Falk Hentschel worked in London as a professional backup dancer for artists such as Mariah Carey, Britney Spears, Paulina Rubio, Jamelia and others. Later he was hired as a choreographer and worked on many music videos and tours in Canada and Asia. In 2003, Falk decided to stay in Los Angeles for good and pursue his dream of becoming an actor. He made his acting debut in the Emmy Award-winning show Arrested Development in 2005. Small parts in Journeyman and numerous low-budget films followed. In 2008, Hentschel decided to create his own projects and wrote the short film Who is Bobby Domino, where he met his production partner Jesse Grace. The two of them went on to write and produce more short films, of which many entered some of the most prestigious film festivals in the world and won numerous accolades. In 2009, Falk landed his first big-budget feature film role as Bernhard the assassin, co-starring next to Tom Cruise and Cameron Diaz in Knight and Day. The following year, Falk played the role of drug addict Richard Conway on TNT’s The Closer, starring Kyra Sedgwick. In 2011, Hentschel played opposite singer Justin Bieber in the CSI: Crime Scene Investigation episode “Targets of Obsession”. He also starred in the NCIS: Los Angeles episode “Archangel”. In StreetDance 2 (2012), he played a major role as Ash, the leader of a street dance crew that performed at a championship in Paris against a rival crew called Invincible. In 2013 he had a supporting role in White House Down where he played Motts, one of the mercenaries who take over the White House. He also starred in the Crackle original movie Extraction where he played Rudolf Martin, a terrorist linked to the National Defense Fund. He guest starred in one episode of the TV series Revenge as Gregor Hoffman. Hentschel plays the role of Bob in the film Transcendence (2014) starring Johnny Depp. He also guest starred in three episodes of The Ladies Restroom where he played the role of Dan. Hentschel had a recurring role on the CBS legal drama Reckless playing Arliss Fulton. In 2014 Hentschel Guest starred in the episode “A Fractured House” of the second season of Agents of S.H.I.E.L.D as Hydra mercenary Marcus Scarlotti aka Whiplash. 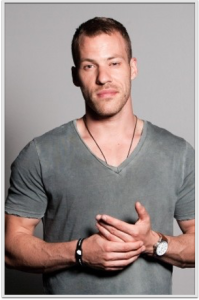 In August, 2015, it was announced that Hentschel will portray the Carter Hall version of Hawkman in the 2016 show DC’s Legends of Tomorrow, and also Arrow and The Flash.